Rocket Matter Knowledge Base Google Integration (Calendar and Email Sync)Things to know before syncing your Google calendar. Once synced with google calendar events will show on your Rocket Matter calendar. If a calendar invitation is sent to a Rocket Matter user from someone that is not a Rocket Matter user, this event will still appear on your Google Calendar and will sync to Rocket Matter as an invitation. Bullets that represent third party invitations will be outlined with the users personal color as you can see below, for at-a-glance referencing. 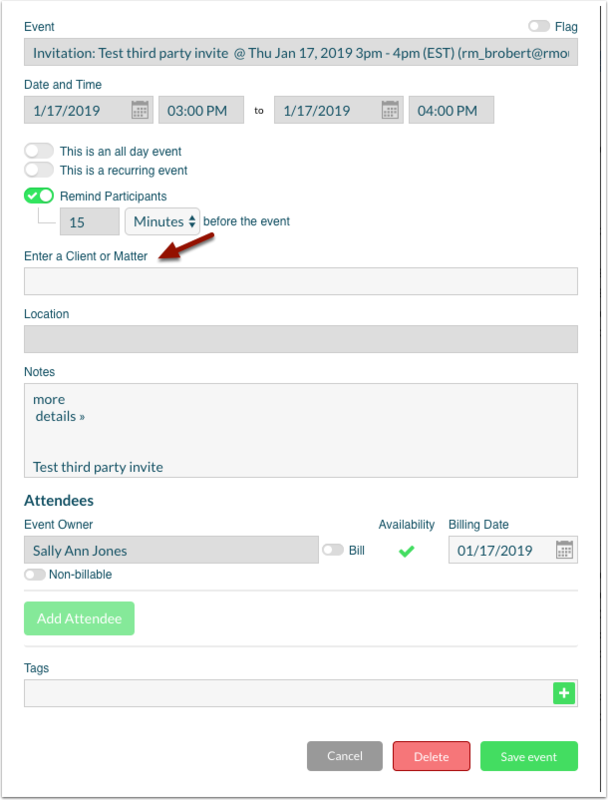 Once you accept a third party invitation, you will not be able to edit the event details as you are not the event owner. Note: You will however, be able to enter a client or matter name in the event if applicable. Prev: How to sync, view and bill for your Gmail emails into Rocket Matter.